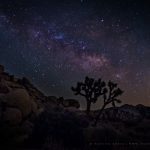 It was a last minute decision to go to Joshua Tree National Park to shoot some Milky Way pictures. 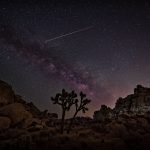 I have always wanted to shoot Milky Way there and jumped at this opportunity. 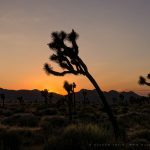 I have been to the Joshua Tree National Park at an early stage of my photography venture, and thus had high hopes and expectation for this trip. The weather forecast was clear skies, with a nice and toasty temperature of 105°F. coincidentally, it was a new moon on that night. A couple of my photography buddies and I decided we had to go down that night. 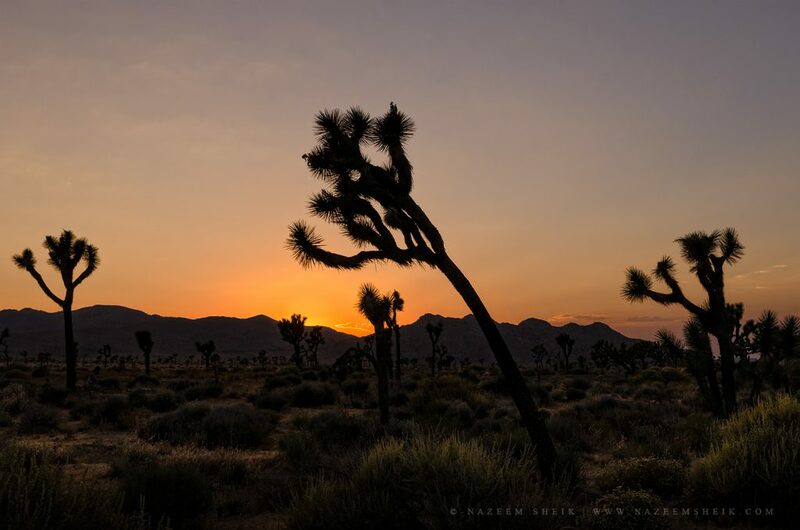 After a grueling long drive, we finally reached Joshua Tree late in the evening, about an hour or so before sunset. 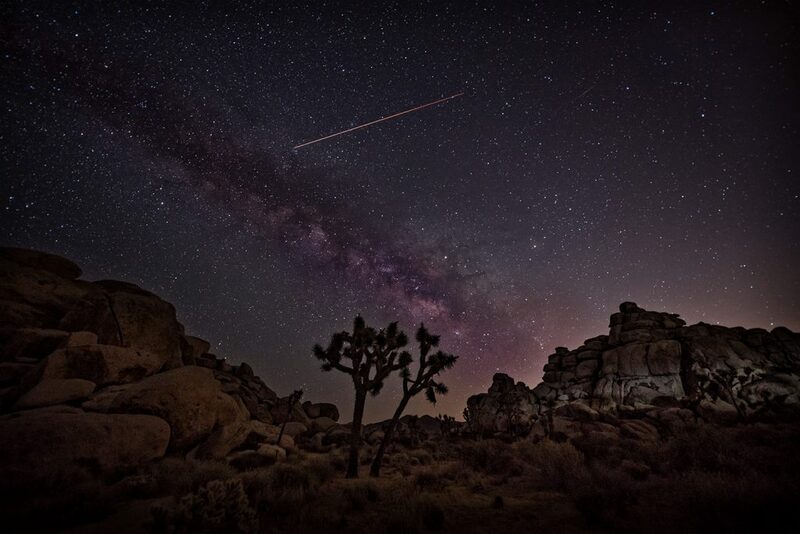 Next, it was all about choosing a good spot to shoot the Milky Way. We drove for a while along the roads in the Park Blvd, hoping to find an interesting foreground. (Note to self: Do your research ahead of time when you are going to the middle of nowhere). Pretty much everything looked the same from all directions, so we decided to start the evening near the Cap Rock. 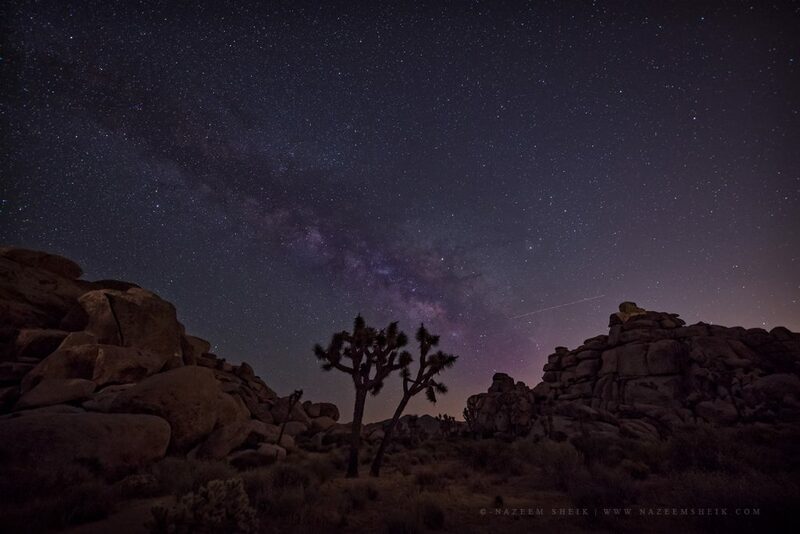 One of my friends then suggested that we use a Joshua tree as the foreground instead of the gigantic cap rock. We then kind of looked around and picked a spot right on the other side of the caprock, where we also saw a trail going between two small hills. Now that we have already picked the spot, we all grabbed our gears and quickly settled down. The blue hour wasn’t that great. I was hoping for some pinkish light scattered across the wide open skies.. buuuuut nothing. I was a little disappointed at that point. We then waited for the light to go down. Sunset on that day was at around 7.50 p.m. After which, the stars started filling up the skies. 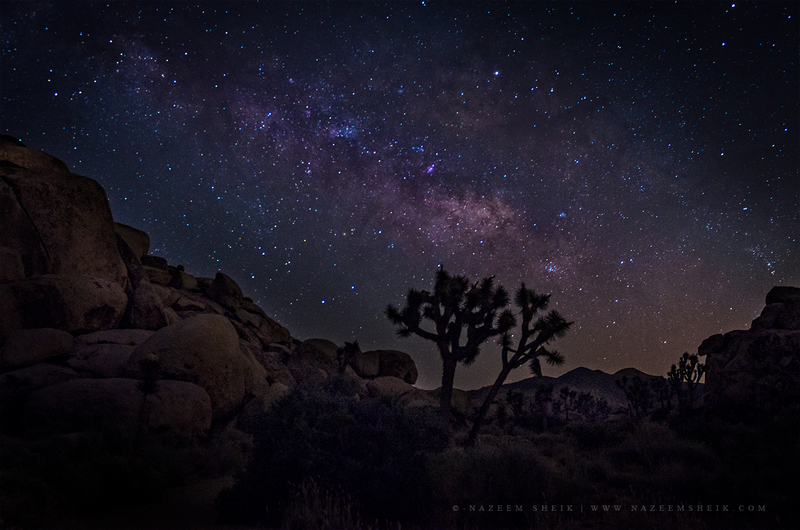 After about an hour or so into the dark night, the Milky Way started appearing along the horizon. We waited a little longer as we wanted the Milky Way in a perfect position. We wanted it a little higher up the sky, situated right in between the two small hills and just over the Joshua tree that was perched in the middle of the valley. We spent some time taking pictures at this spot near the Cap Rock and then decided to look for another spot in the park. 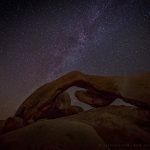 I suggested the Arch Rock as I have seen some amazing pictures from this spot by other photographers. After driving up and down the Park Blvd a couple of times, we took a right into Pinto Basin Rd. After a short drive, we saw the White Tank camping area. We quickly got out, grabbed our gear, and started walking towards the Arch Rock. We had to make a short hike up and that was fun, but a bit challenging in the dark. There was already a group of photographers there. Having realized that we will not have the location exclusively to ourselves, we just took a few quick snaps and asked the other photographers if it was alright if they didn’t use their headlights for a while. They were kind enough to agree so we took a couple of shots. I had actually wanted to try a few light painting but it was way too late in the night and we had to head back to reality AKA home. So, we decided to call it a night. Even though the photo trip didn’t result in any great pictures, it was fun hanging out with my friends. 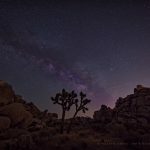 Having experienced Joshua Tree now, I am definitely going to come back for a visit, But, not before I plan better and bring less gear to carry around the different spots. 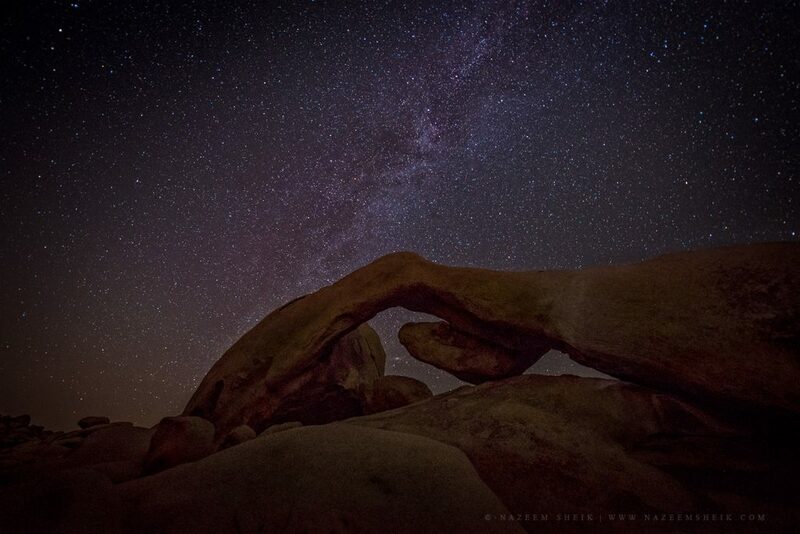 Hope you enjoyed reading about my interesting night at Joshua Tree National Park.